The alarm bell screeched with maximum volume! The Manager’s heartbeat immediately started to pound loudly as this was the first time that she had heard the sound, after all, it had never actually gone off before….ever! Other Managers around her also started to run around in a panic as they too had no idea what to do. The worried Managers huddled together as they quickly searched through their book of corporate policies and procedures. Finally, on page 272, there they found the answer. It was a “non-conformity” alarm! But how was it activated, and how do they stop this continual noise permeating through their normally quiet office floor? Unbeknownst to the Managers, one of their employees had decided to mount a personal revolt! Let’s go back to 8:30 AM that morning to understand the origin of this mystery! Employee number 468136, aka Bernard Smith, arrived at his allocated work station. His desk was the same as every other desk on his office floor. It was white, immaculately tidy, a computer placed centrally, 4 piles of primary coloured folders on the left side, and had a standard black chair with his name branded on the back. Bernard was dressed in his black suit, white shirt and company embellished logo tie, just like all his fellow male workers. At precisely 8:31 AM, each employee started to type on their computer and the day commenced just like every other day. However, at 8:32 AM, Bernard stopped work. He looked up and down the line of desks, each positioned in a perfectly straight line so as to not break the red laser beam, and thought…..”enough”, as a bead of sweat slowly rolled down his forehead. To the amazement of those sitting around him, he took off his tie and undid the top button of his business shirt. Silence and an uneasy feeling quickly started to prevail. Bernard had taken the first step to his creative freedom and it felt good! As his confidence increased, he messed up his 4 folder piles. Then he did something completely radical, he moved his desk over the laser line and turned it by a full 180 degrees. He was now facing into the office, rather than a wall! The Managers now knew the cause of the alarm and initiated an immediate and successful remedy. They decided to quickly reconfigure all work desks with Bernard’s new alignment so each and every desk now faced inwards. 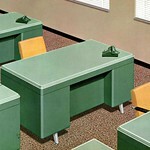 Once again quietness was instilled in the office as all desks now looked precisely the same as all the others. As the week progressed, the bewildered employees slowly got used to their new desk view until normality once again was achieved. But not for Bernard, he still had no tie around his neck and there was no way he was going back to that form of corporate fashion control. He liked his messy folder pile and the air movement around his uncollared neck. It was time for revolution……!! That’s “no tie Friday” for you. Thanks for the new slant! Thanks Sholto for the suggestion, what about Bow-tie Thursday?